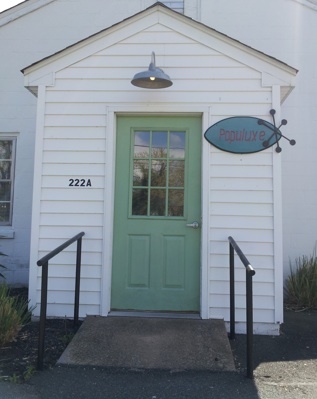 Populuxe is a store in Colonial Beach "where kitsch meets cool" with plenty of retro goodies. You might feel for a minute like you have taken a time machine back to the 1960's. Owners Dom and Charlene Russo are recent transplants to the town, relocating here from the northern Virginia region, and since they both work full-time jobs, Mom Charlette Russo will mind the shop on weekdays. She was a regular performer on American Bandstand in the late 1950's! The term "populuxe" refers to Googie (or Doo-Wop) architecture, which is influenced by car culture and the Space and Atomic Ages. (Think The Jetsons and Seattle's Space Needle). It originated in southern California during the late 1940's and continued into the mid-1960's. Characterized by the use of upswept roofs, curvy geometric shapes, and bold use of glass, steel and neon, the types of buildings that were most often designed in this style were motels, coffee houses and bowling alleys. This shop used to be located across from the Visitor Center at the end of Hawthorn Street. Now they are near Sea Side Restaurant on Wilder. Things that can be found in this shop include Jewelry, books, music, vintage clothing, furniture, accessories, art, comic books and more! Open daily except for Tuesdays.